I decided to change things up a bit, so today’s post is a vlog (video blog). Anyone who knows me knows that I get an eye twitch when people misuse (or misspell) common words. I visibly shudder if a writer uses the incorrect “they’re/there/their”. 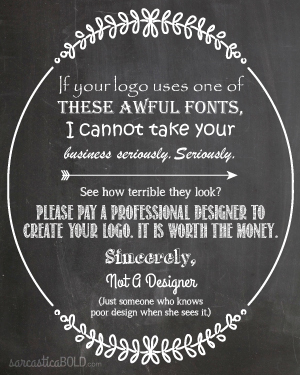 There is just no excuse for misspelling words on a computer – everything has spell-check – and lack of punctuation in a sentence makes me want to pull my hair out. If you made it through elementary school, you should be able to use basic spelling, grammar, and punctuation correctly. I don’t understand how American adults can be so blasé about these things. If you don’t use basic elements of your native language correctly, it makes you look dumb. Who wants to look dumb? For today’s vlog, I decided to focus on “your” versus “you’re”. I am genuinely flummoxed by the misuse of these words. They mean completely different things, and it’s not hard to remember which word means what. If you do find it confusing, don’t worry – I set you straight in the vlog. It’s possible that you might feel this video is somewhat harsh. In it, I make several references to the correlation between misusing everyday words and looking like an idiot. If this level of honesty offends you, please don’t watch this video. This vlog is meant to point out how ridiculous it is that grown-ups can’t figure out which “your/you’re” to use when sending written words out into the world. If it offends you to hear me say that this is stupid, be glad you can’t hear what those who do know the proper ways in which to use these words are thinking upon seeing “your amazing” written on someone’s Facebook wall. I feel like everyone I know is having babies. Literally, my Facebook Feed is covered in baby news – photos of bumps, announcements of impending parenthood, new babies in hospital hats and blankets. New life abounds. My kids are in elementary school (I know; I look too young to have kids that old. Stop; you’re too kind!) The ol’ hubs and I decided several years ago that two is the perfect number of kids in our family, and (despite a couple of scares here and there) we’ve not wavered from that. We’re still not wavering, even with all of the cuteness thrust in our faces on a daily basis. (I mean this with total love, friends.) But there is something about holding a new baby, and smelling that New Baby smell, that gives my ovaries a little jolt. Friends are growing babies, or bringing babies home, or snuggling babies. We have just become new parents again…to little baby chicks. Yes. 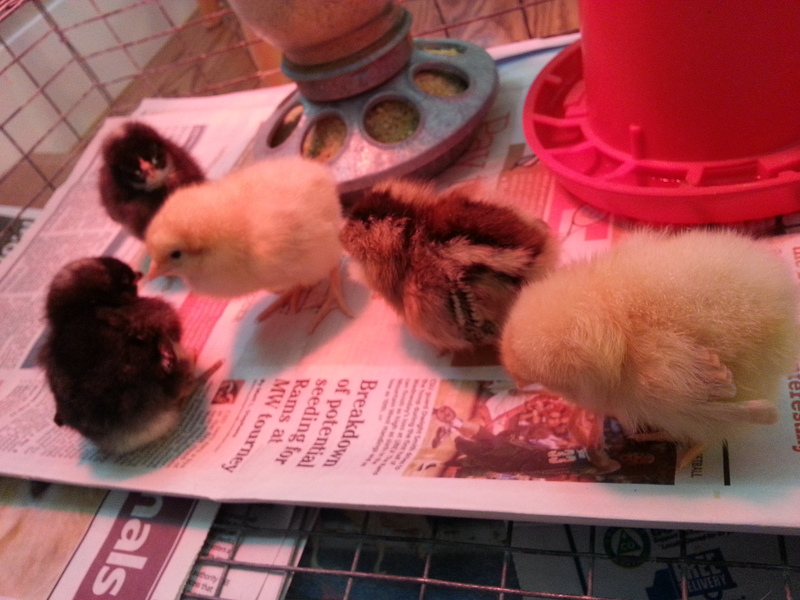 We now have five baby chickens, and they are so stinkin’ cute. See? Seriously, I feel like they are now my babies. I just want to watch them as they climb all over each other, or huddle together for naps. I want to reprimand them when they tussle, and cuddle the fluff off them. And it’s not just me – my kids are enchanted by the chicks. I caught them laying on the floor by the cage, blissfully watching the chicks be chicks. So, this is what happens when your biological clock still has a little life in it, but is overruled by your practicality – you compensate by adopting baby animals. I hate you, Spring Forward. Oh, sure – you make the days seem longer, thanks to the extra sunshine. But, seriously, I don’t know that you’re all that necessary in the modern world. I’m not sure it matters whether not we get an extra hour of sunlight – I mean, if we want an extra hour of light by which to do things, we can just turn on a light. Whenever we want. Which is what we do during the long, dark winter nights – it’s not like that one hour has ever made a difference in how I structure my activities. It is 2014, people! Losing that one hour means my kids will get up that much earlier. They already get up too early; we don’t need to enable them further. It also means they’ll argue for staying up later, because “it’s not dark yet!” The arguing, the pleading, the gnashing of teeth – why must you torture me? And, really – the main reason I hate you is because I am not a morning person. I need that extra hour, because I stay up late, getting things done while everyone is asleep (read: not bugging me). I am most productive between the hours of 9pm and 2am, which means my morning alarm comes too soon…even when all of my hours are accounted for. Taking away one precious hour of sleep means Mama Bear is a grumpy grizzly, at least during the morning rush. So, while I’m appreciative of the coming Spring, I do not appreciate you, Spring Forward. I’m exhausted. Go away. Friends, I’m a busy gal. Even though I spend a lot of time online, I’m mostly working or doing homework. I get behind on reading content on blogs and other sites pretty much every week. Also, I tend to find something online that I want to read or reference later, so I keep the site up on a tab in my browser…which is why I have approximately 4,297 tabs open right now. Yeah, not really working out that well. I just learned about a couple of cool sites to help me organize content – Digg and Diigo. Digg is an RSS reader. I can add blogs, news sites, or anything that updates content on a somewhat regular basis to my Digg reader, and voila – I can catch up on everything, all in one place. Time-saver. Diigo is a little different – while it allows me to organize content, collaborate with others, and more. It’s like bookmarking, but I can access content from any computer, anywhere. Handy. So, there you go. Two ways in which I use technology to help me manage technology. No, the irony is not lost on me. 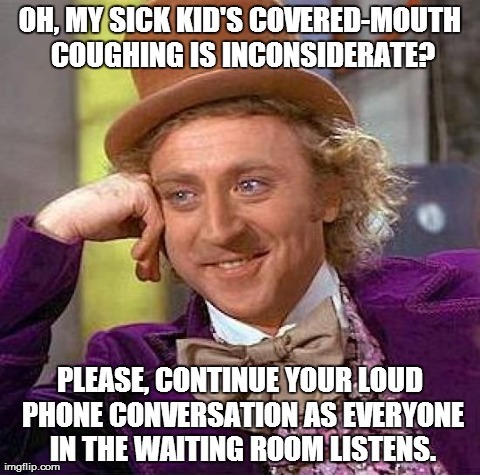 Today, my son and I were sitting in the Imaging Center’s waiting room – my son needed to get some chest x-rays to rule out pneumonia. He was coughing (hence the need for the x-rays), but doing a great job of covering his mouth (coughing into his elbow, like we’ve been teaching him to do since he was a toddler). A lady waiting for her own x-rays comes into the room and sits behind him. She hears him cough and asks me if he’s sick. “Yes,” I said, “but he’s really good about covering his mouth.” As she could see, because he just did it. Uhh…excuse me? He’s covering his mouth, and she was sitting back-to-back with him, with the backs of two chairs separating them. Following this pronouncement, her phone rings and she commences a rather loud conversation that probably should have waited until she was in a private setting, given what I could hear (i.e., everything she said). I wanted to tell her that my 6-year-old, sitting quietly without disturbing anyone, has better manners than she. I’m just going to tell all of you instead. Christopher Titus is one of my favorite comedians/social commentators. His stand-up is just so good, and I loved his network sitcom (which is probably why it got canceled – everything I love dies). Last week’s podcast, “Sochi, So Sad”, was mostly about the craziness that is the 2014 winter games. The first 15 minutes or so are classic, brilliant Titus. After that, the podcast gets long and windy, but Titus and crew bring it home in the end. There is some language in this podcast. It’s Titus – what do you expect?